When I first looked at the work of Tokuda Yasokichi III (b. 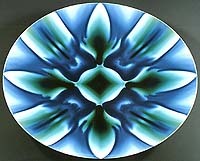 1933) I had to put on a pair of sunglasses -- I was almost blinded by the intensity of his kaleidoscopic Kutani porcelain. Tokuda's ceramic art doesn't look anything like the overglaze enameled Kutani people are used to, like the red Meiji Era pieces that are quite common at antique markets and in the souvenir shops of Komatsu, Ishikawa Prefecture, where much of Kutani is made. 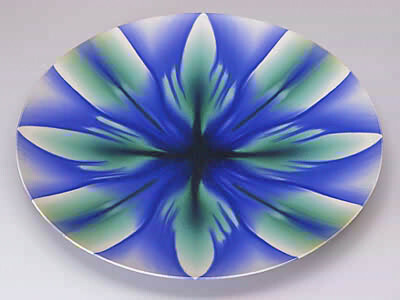 His large hachi (platters or wide bowls), with bright yellow borders, look like the Ring Nebula with their dark mysterious centers and pulsating bright edges. For his mastery of Kutani glazes, Tokuda was named a Ningen Kokuho (Living National Treasure) in 1997. His "50 Years as a Potter" exhibition is on until Nov. 13, 2000, at Nihonbashi Mitsukoshi's sixth-floor gallery. Tokuda was born as Masahiko and started potting at 18; he took the potter's name Yasokichi in 1988. His grandfather, the first Yasokichi (1873-1957), rediscovered many of Kutani's lost traditional glazes and for that was made an Intangible Cultural Property by the government. Granddad's work was so skillful that his pieces were hard to distinguish from the Ko-Kutani (Old Kutani) and Yoshidaya styles, the epitome of Kutani up to that point. The first Yasokichi was born into a family of dyers, which accounts for his interest in how colors relate to materials and form. At first he aspired to be a painter under Tanrei Araki and Eiki Yamamoto, but soon changed paths to porcelain under the tutelage of Shoundo Matsumoto. The first Yasokichi provided Kutani with new pigments that were said to surpass the originals. In particular, his purple pigment was renowned. In Kutani pottery the five colors (go-sai) reign supreme: red, blue, yellow, purple and green. The origin of these pigments is in Ming Dynasty Chinese porcelains.  Yet Kutani retains its own identity and is purely Japanese in the usage of the pigments. The first Yasokichi once said to his grandson that, "If you have these pigments you can live off them for the rest of your life." It would have been easy just to copy his grandfather's style and make a very handsome living doing traditional overglaze enameled works, but when a painter friend suggested to Tokuda that he attempt to make Kutani without overglaze enamel decoration, he decided to begin his own research. Since then, like his grandfather, he has experimented with pigments and firing methods that have brought forth a whole new Kutani universe of brilliant color schemes. 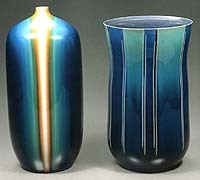 Tokuda has given his glazes different names such as yosai ("gleaming colors") and hekimei ("clear blue"). Like any potter whose glazes dominate the work, he must keep the forms simple so they do not compete. In the current exhibition the large hachi, tsubo (jars) and hanaire (vases) are straightforward. But the colors! One yosai hachi, done in blues, whites and greens, is set in motion like a pinwheel; the more one looks at it the faster it turns. On a yosai hanaire, stratified layers of vertical color dance around the piece and dazzle the viewer. Another, with its blurry chromatic palette, looks as if the colors are reflecting off water or being diffused through a rose window. Yet another looks as if one were viewing it through a kaleidoscope. Tokuda does have a quiet side to his work as well, usually expressed with his hekimei glaze. A tall vase with a pencil-thin neck stretches skyward; it seems Tokuda took the neck up to the extreme limit. I can imagine he put many of these forms in the kiln and most of the necks just toppled over. The proportions look a little odd, though. Many of his hekimei works bulge in a way that offers the viewer a path for the eyes. Otherwise, the monochrome tone and the conventional form would be boring. A slight shimmy on the side is the one savior for some of the hekimei works. With the auroral glazes though, it becomes quite difficult to get the twinkle on all forms. Tokuda's glazes excel on the larger pieces but don't come off as successfully on the smaller ones, like tokkuri (sake flasks) or chawan (tea bowls). I think it might even be nauseating to drink matcha from one of his chawan. The colors clash: emerald matcha and a purple chawan -- not an appealing match at all. Viewers of Tokuda's work either love it or hate it; there's no in between. Some think it's as magnificent as a photo of the Ring Nebula taken from the Hubble Telescope; some think it belongs in a shop in Shibuya 109. You be the judge. Just don't forget your sunglasses.